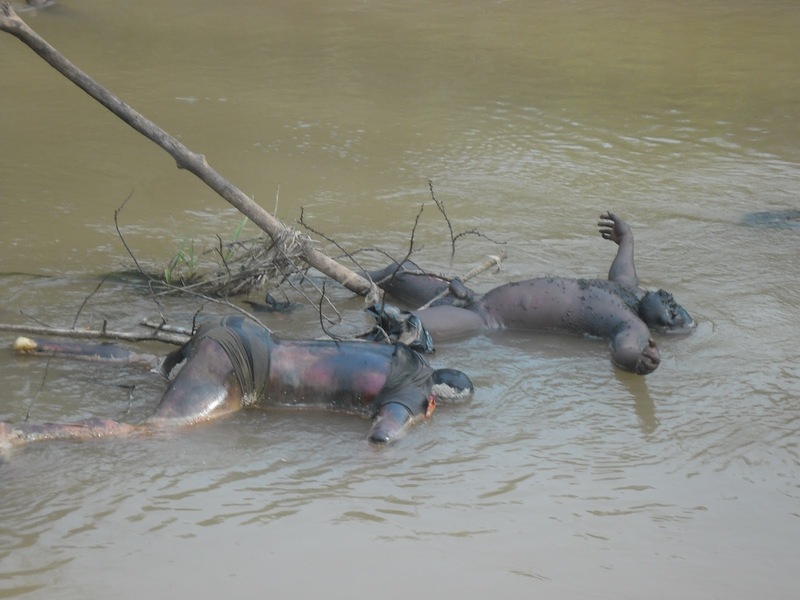 Apprehension best described the mood in Ugwuoba Enugu state when they woke to see over 14 lifeless bodies of human beings partly dressed floating on the Ezu River, Ugwuoba, a boundary town with Anambra state. The Ezu River flowing down to Ugwuoba from a town called Agbaogugu is located between Ugwuoba community in Enugu state and Amansea community in Anambra state. The lifeless bodies sighted Friday morning were already decomposing an indication that they were dumped some days back somewhere at the Ugwuoba end of the Ezu River before the bodies flew down to the bridge and where people could see them. Some wore pants, some wore singlet and others outright naked. 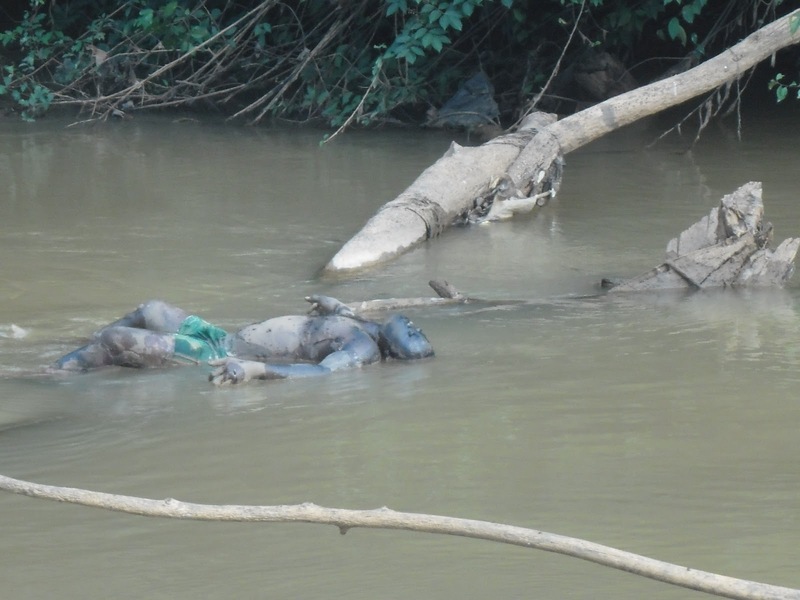 By Saturday evening, over 60 policemen in three patrol vehicles from Enugu State and Anambra State were there struggling to unravel the mystery behind the dumping of lifeless bodies at the Ezu River Ugwuoba , Enugu State. A boundary town to Amansea , Awka North of Anambra state. The policemen came in patrol vehicles with registration Number NPF 117 C, with inscription Anambra Cobra squad B division; NPF 2347 C Enugu State Anti robbery squad and another plateless van written Cobra squad. The police were not harassing anybody as they just watch and discuss on the possible actions to be taken even as more than one thousand people have visited the scene since the news broke Friday morning to have a glance of the life less bodies, especially if any is someone they know. The leaders of Amansea and Awka North local government as well as the Anambra state Government have all visited the scene in sympathy of the Ugwuoba community and Save Our Soul cry to the Enugu state government to come to the scene for further actions. They confirmed there were no gun shots last night. 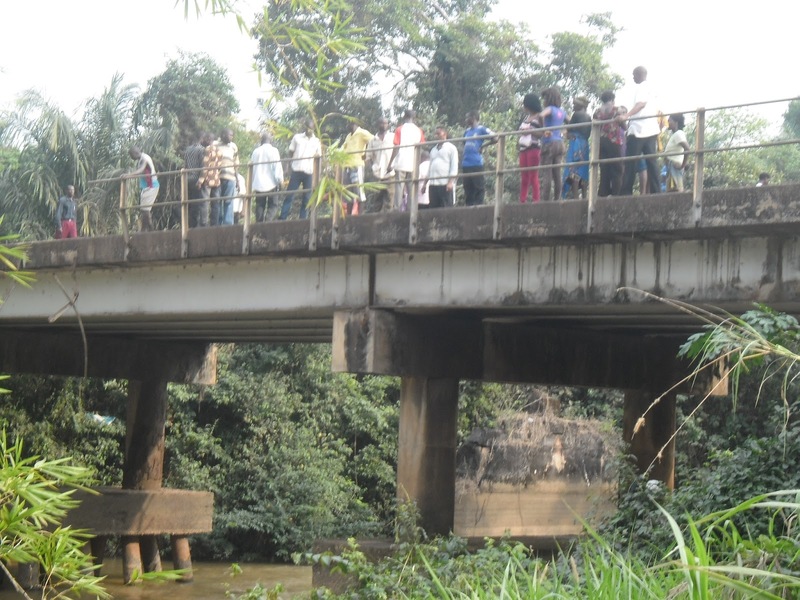 The Awka North leaders were concerned about the epidemic the decomposing bodies will cause all those in the Ezu River bank from Ugwuoba to River Niger as many depend on the River for their daily chores and drinking. The traditional ruler of Amansea Igwe Kenneth Okonkwo and members of his cabinet as well as Member representing Awka North in the state House of Assembly , Hon Rebecca Udoji as well as Chairman of Awka North local government area , Hon Joy Enweluzor all condemned the perpetrators of the heinous act against humanity. The victims are allegedly from Igbo race and too numerous questions raised by indigenes and visitors alike could not be answered by anybody at the scene. The questions included who killed as many as over fifty or up to hundred if not more than one hundred people? Who dumped them in the only source of river for over 100 communities stretching from Enugu State to Anambra State, even up to the River Niger through Omambala (Anambra) River? 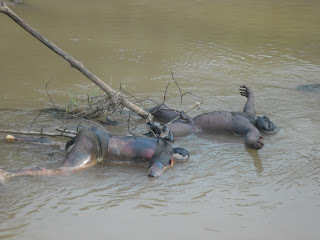 There is a police check point near the River where these bodies were found and nobody was arrested or seen committing the sacrilege against humanity by polluting water flow that many villagers drink and use for domestic chores? Who gave the decomposing bodies machete cuts? Some were even sinister by asking was it not Special Anti Robbery Squad (SARS) of the Nigerian Police that decongested their prisons of criminal suspects? Others were of the view but why would they dump them in the River instead of burying them? Anambra State Government noted that although the sad event was not in their territory as it was Ugwuoba axis that it happened had sent a Save Our Soul (SOS) call to Enugu State Government and its police commissioner to come and investigate the deposit of many lifeless bodies in the Ezu River. Governor Peter Obi represented by the Commissioner for Local government Affairs , Hon Azuka Enemuo and a team of her local government chairmen including Awka North , Hon Joy Enweluzor whose communities from Amansea to Ugbene, Ugbenu and Awba-Ofemmili to Amanuke and Achalla even Mgbakwu and Urum will suffer the water pollution and subsequent epidemic. Others with Azuka’s entourage to the scene included Chairman of Chairmen Hon Daza Udeozor, Onitsha South Ugochukwu Ezeani , Orumba South North Emeka Aforka among others. Hon Enweluzor whose territory was seriously affected could not utter a word as she was surprised and speechless on man’s inhumanity against man in this age and time especially with the pollution and imminent water disease which may leads to epidemic. 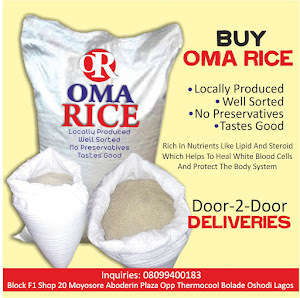 The Anambra State Police Public Relation Officer, Mr Ralp Uzoigwe allegedly reported to have said his command was not aware of the dumping of lifeless bodies but efforts to get the Enugu State PPRO Ebere Amarizu to confirm whether SARS of Enugu State of the Police dumped bodies to decongest cells in Enugu State was not successful. We the people of Amansea town hereby say ‘NO’ to Igwe Kenneth Okonkwo (Igwe Osuofia II of Amansea). Igwe, we are tired of your enslavement and barbaric rule over the people of Amansea over the past 30years, the intimidation, blackmail, greed, imprisonment, unrepentant nature and refusal to allow the light of the gospel shine in Amansea. Igwe, do you know that traditional councils and Town unions are two different institutions? Why must you preside over both, Igwe of Okadas, Igwe of the villages, Igwe of Oye Amansea, Chairman of all families in Amansea, HABA!!!..... Shouldn’t we call you both witch and wizard of Amansea? We must change you name to KING NEBUCHADNEZZAR OF AMANSEA’. Igwe Kenneth Okonkwo, be aware that the people of Amansea will neither “worship you or your gods’, we condemn all forms of satanic rituals done by you, we say ‘NO’ both physical and spiritually. Igwe, you claim to hate the state government but you continually divert all state government projects for your own personal gains thereby sitting upon all dividend of democracy from the state government, a reason you have mounted your barbari authority over every institution in Amansea and now wants to place your puppets in our town union. Igwe we say No to your modern day form of slavery and barbarism and we declare FREEDOM for all people of Amansea. FREEDOM FOR OUR YOUTHS….. We demand that lights of the younths of Amansea to shine now and forever , and any attempt by you to stop this freedom movement will be met by the HOLY GHOST FIRE as your SATANIC rule is dethroned for the sake of the LIGHT of the GOSPEL…….AMANSEA IS FREE!!! Igwe Kenneth Okonkwo is the only traditional ruler in Anambra state with membership to 3 political parties, he thinks we are not aware he is a PDP member, an ANPP member and also an ACN member, he is an active card carrying member of these parties, Amansea will support our Governor Peter Obi for the sake of ‘FREEDOM AND PROSPERITY’, we reject most political figure as they have all been instrumental to our decades of SERVITUDE to this monster called Igwe Kenneth Okonkwo. We declare this freedom movement sealed with the blood of JESUS and HIS enlightenment to every soul reading this in Jesus name, Amen.